1st comment!! haha those are adorable!! I love the giraffe!! that little man sweater is so sweet! I think my little guy may need one too... :) Love the list! aww these are sooo cute!!! OMG those overalls are the cutest!!! Eeeep! Even baby wish-lists are cute! I hope he gets everything he wants this year! This is so sweet. Baby sized things are just cuter and fun to look at! love each of those things! goodnight moon is my daughters favorite book. i have to read it to her every day. all these things are so sweet! Its all so tiny and sweet! I love it! I use Burt's Bee's Baby Bee line for Rafael and everyone is always commenting on how wonderful he smells. It's such great stuff! Those blocks are really cool. cutest. I LOVE BABY SHOES! Ummm...you have to get Sophie the Giraffe. It is worth every penny! adorable. especially that sweet giraffe and those moccasins. i'm dying over here. Those books are classics! Love the baby cardigan! My Ellis had that owl, he loves that thing, laughs at it and sleeps with it every night. Oh, Pat the Bunny! I still have my very loved version from when I was a baby. I love Burt's Bees! I bought my daughter the BlaBla bear for Christmas! They are so cute! 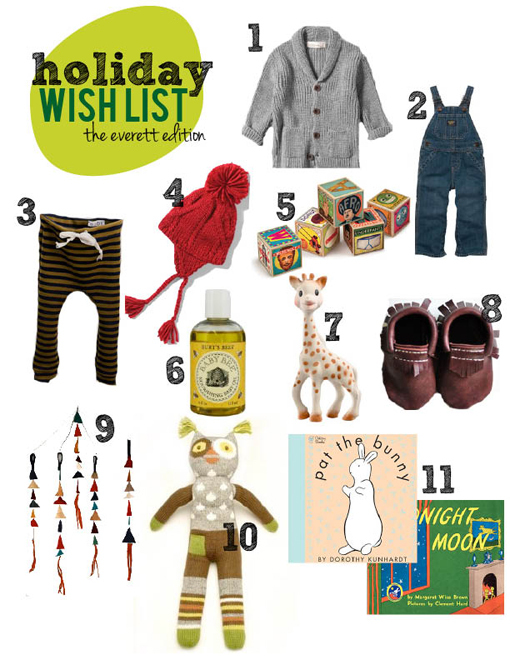 I seriously heart everything on this wishlist...such-cute-things! What a great wishlist. So many cute things. The holidays are so fun with a baby in the house to shop for. What cute little shoes. I can't wait to have little cuties to dress! goodnight moon is definitely a classic! goodnight moon in my FAVE! I have that same grey sweater for my little guy. He also loves to be read Goodnight moon! That's a classic! I hope he gets all of it from Santa! Avery loved Sophie! Oh and our boys smell like Burts Baby Bees too!! Love it all. what a great gift list!! this is soo perfect for me... a soon to be new mom!!! My niece LOVES Sophie!!!! Good item on the wish list! GOODNIGHT MOON!! SUCH a classic!! Mom mom used to ALWAYS read us this!! how did this giraffe get so popular? lol every darn kid I know has one. It's uncanny! the moccasins and the long johns. STOP. so cute. 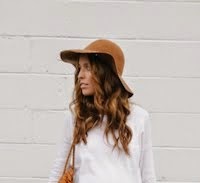 I was looking at a home decor blog and came across your pic! I thought it might be flattering to know that you're being used as model on another blogger's site. She liked the chunky scarf you had on. Sydney darling, I actually shrieked when I saw Sophie the giraffe. I have been looking for her for ages but couldn't remember her name. I don't even have children yet but I'm buying her now to set her aside! I certainly hope we will be seeing Everett utilizing these adorable things in the near future. Merry Christmas to your beautiful family. Every child I know loves Sophie the giraffe! She's the best! Ah, this is so cute. =) "Pat The Bunny" is to die for. LOVE zara clothes for baby - i got a sweet little plaid shirt for marcus from zara and i couldn't be happier - super soft and great quality. and those moccosins you put on the list - TO DIE FOR! Awwwwh, everything is so adorable here! Those baby moccasins! Love them! parker NEEDS THOSE STRIPED PANTS. I just love the moccasins! that burts bees baby oil is magical, trust me! I am dying over those overalls. SO darling. Just noticed in this photo: http://instagr.am/p/ZYK9s/ the babe totally has Tyson's ears! How precious! Oh, I'm so happy for you and your little family, Sydney. OK you NEED to read this comment. You may skim the others but please read this. Buy the Fisher Price Seahorse and also the Fisher Price Jumperoo when he is a bit older (~5months). Both will save your life at one point or another, I am NOT kidding. I am completely in love that you have pat the bunny up there...this makes me feel so delightful. Everett is one stylin' babe.